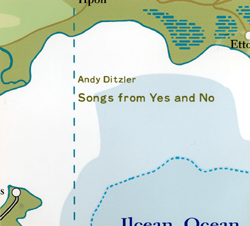 "Yes and No" is a theatrical performance piece that Ditzler premiered at Clayton College & State University in 2002, and this show is a CD-release celebration for "Songs From Yes and No." The songs are smart and funny all by themselves. The lyrics of "Just the Six of Us" consists solely of other song titles. Ditzler's playful yet insightful tunes are like a poppier and more traditional theatrical take on the work of Laurie Anderson. The ghost of Frank Zappa pops up occasionally, too, but Ditzler doesn't traffic in scatological and sexual humor, but rather in political and social observation. In "Economics," the protagonist can't find the foreign film he's looking for, but the video store has 100 copies of four movies, each one about a man "wronged by the system who takes the law into his own hands, exonerating himself, while single-handedly fighting the police, terrorists and the CIA."